Open access Differing modes of animal exploitation in North-Pontic Eneolithic and Bronze Age Societies, by Mileto, Kaiser, Rassamakin, Whelton & Evershed, STAR (2018). You can download the PDF. This paper presents new results of an interdisciplinary investigation of the diet and subsistence strategies of populations living in the North-Pontic region during the Eneolithic and the Early Bronze Age (ca. 3800 BC to the 2500 BC). New organic residue analyses of >200 sherds from five Eneolithic sites and two Early Bronze Age settlements are presented. The molecular and stable isotope results are discussed in relation to zooarchaeological evidence. Overall, the findings suggest that each community relied on either a hunting- or a husbandry-based subsistence strategy dependent upon the ecosystem in which they settled; horses and wild animals dominated subsistence in the forest-steppe communities in contrast to ruminant husbandry in the steppe. 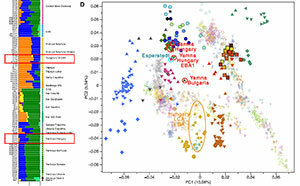 During the last two years, new palaeogenetic evidence has been uncovered indicating migrations from the steppe to Central Europe involving a substantial number of people (Haak et al. 2015; Allentoft et al. 2015). This reinvigorated the controversial debate surrounding the homeland of Proto-Indo-European language. 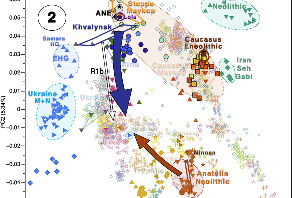 Several scholars have interpreted the new palaeogenetic data as supporting the hypothesis that the original speakers of PIE lived the western part of the Eurasian steppe (Kristiansen 2014 for a critical approach cf. Heyd 2016; Kaiser 2017). The introduction of specialised animal husbandry and the emergence of mobile pastoralism, often assumed to be closely connected with that introduction, still thought to constitute one of the early and highly influential innovations that took part in the Eurasian steppe zone (Merpert 1974). Although there has been a tendency to consider the Eurasian steppe belt as a uniform ecosystem, it is indeed very diverse, stretching from Moldova and Ukraine in the west, to Mongolia in the east. The Ural Mountains can be considered as a natural border that divides this vast area into two very different ecosystems: the western Pontic region and the eastern Eurasia, each characterized by diverse soils, climatic zones, vegetation and faunal composition. The forest-steppe forms a transitional vegetation zone (ecotone according to Walter and Breckle 1977) between the steppe in the south and the forest in the north. This holds true for the region north of the Black Sea. Climatic features, vegetation and faunal composition change depending on the proximity to the Dnieper River, which is the main river that bisects the region, from north-west to south-east, and to the Black Sea, which is the southern border of the region. 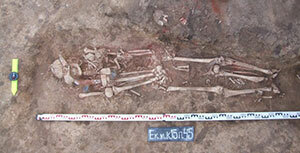 The Dereivka and Molyukhov Bugor sites are located in the forest-steppe area of the modern Cherkassy Region. The Dereivka settlement was situated on a promontory of the River Omelnik, a tributary of the Dnieper River. 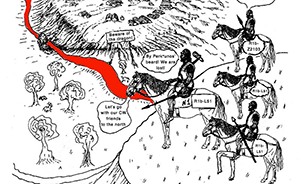 It is the best-investigated North-Pontic settlement of the Eneolithic (Telegin 1986); nevertheless, many questions remain concerning the chronology, subsistence economy and the status of horse domestication, amongst the community who inhabited this settlement (Levine 1990; Rassamakin 1999; Mileto et al. 2017). 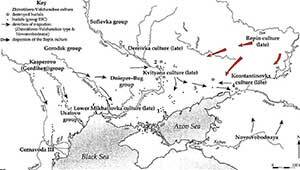 The Molyukhov Bugor site was part of Dereivka culture (Rassamakin 1999) and was located on the Dnieper River, near the village of Novoselitsa, Chigirin District (Kotova 2003). Both of these forest-steppe sites were highly influenced by the neighbouring communities of the Tripolye culture, as suggested by several imported materials (Rassamakin 1999). (…) the economic strategies of the communities lived in the steppe were similar and based on extensive pastoralism of ruminants and exploitation of secondary products confirming that from the Mid-Eneolithic onward (Mikhailovka I site, discussed in the previous section) the steppe people possessed a sophisticated knowledge of animal domestication. Furthermore, the lipid residue findings did not reveal significant changes in the type of animal products recovered from pots. The main transformation relates the faunal records that revealed an increasing percentage of cattle bones in the later sites (Figure 3), which might suggest a transition from a highly mobile pastoral economy to a more sedentary one, as cattle are usually more exploited by settled communities (Kuzmina 2003). However, this contradicts suggestions of an increasing nomadic pastoralist economy from the 3rd millennium BC onward (Anthony 2007). Since, the results presented herein cannot provide a definitive answer to the latter question, resolution will have to await future investigations. Relative proportions (NISP%) of the different classes of animals inferred from faunal records in Dereivka (Telegin 1986); Molyukhov-Bugor, (Bibikova 1963; Zhuravlev and Markova 2000; Zhuravlev 2008), ; MikhailovkaI, II and III (Bibikova and Shevchenko 1962) and Generalka (Kaiser 2010; Tuboltsev 2006). There was a considerable variation of animal exploitation in the forest-steppe sites compared to the steppe sites, confirming the results of previous researches (Outram et al. 2012 ; Lillie, Budd, and Potekhina 2011). Despite the complications (i.e. peculiar soil and mixed archaeological layers), the zooarchaeological analyses are largely consistent with the lipid residue findings. 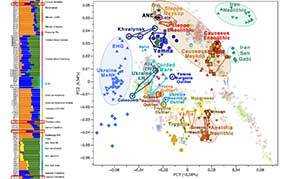 The lipid residues revealed that ruminant dairy products were exploited by the communities of the steppe from the Mid-Eneolithic period (MikhailovkaI site). This suggests that these communities were pastoralists possessing a sophisticated knowledge of animal domestication. According to the zooarchaeological record for this site, animal husbandry became the primary subsistence strategy in the 4th millennium BC. At first, the livestock consisted mainly of sheep and goats, with a shift to cattle only detected with appearance of the Yamnaya culture (3100 BC onwards). The forest-steppe appears to have been populated by hunters-fishers as the two investigated sites (Molyukhov-Bugor and Dereivka) displayed a predominance of wild animals, fish and horse remains (Rassamakin 1999; Lillie, Budd, and Potekhina 2011). The Molyukhov-Bugor site revealed a higher percentage of cattle bones and lipid residues of ruminant origin, suggesting that dietary habits were more varied compared to Dereivka, further suggesting that specialised substance practices can exist between sites even within the same, or similar, region. The latter dietary difference can be explained by a possible greater influence of the Tripolye culture to the closer Molyukhov-Bugor community, a suggestion also supported by the greater number of Tripolye imports discovered in Molyukhov-Bugor in comparison to Dereivka. 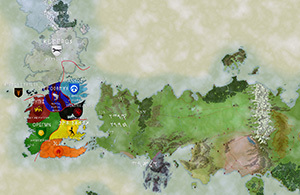 Significant exploitation of horses was confirmed in the region. The lipid residues revealed that the two Mid-Eneolithic forest-steppe communities exploited horses extensively. 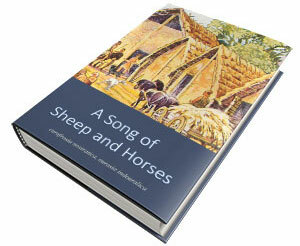 The steppe communities also exploited horses but to a much lesser degree. Finally, a curious enrichment in δ13C16:0 values toward heavier carbon isotope values (increasing C4 plants?) was detected, especially associated with the residues with a ruminant dairy fat origin. The latter might be related to a seasonal effect and/or to greater summer aridity (Evershed et al. 2008) and/or seasonal pastoralism (Rassamakin 1999). 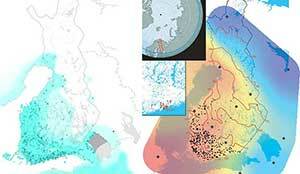 In a recent conversation, I realized that I didn’t know of a model dividing potential communities in the Eneolithic North Pontic area. 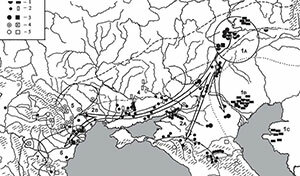 Rassamakin, as I already said, is one researcher to follow for steppe-related cultures and populations, especially from Ukraine (and the Dnieper-Dniester region), and thus for the potential origin of Corded Ware migrants. 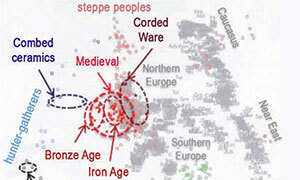 Science and Archaeology (Humanities): collaboration or confrontation?